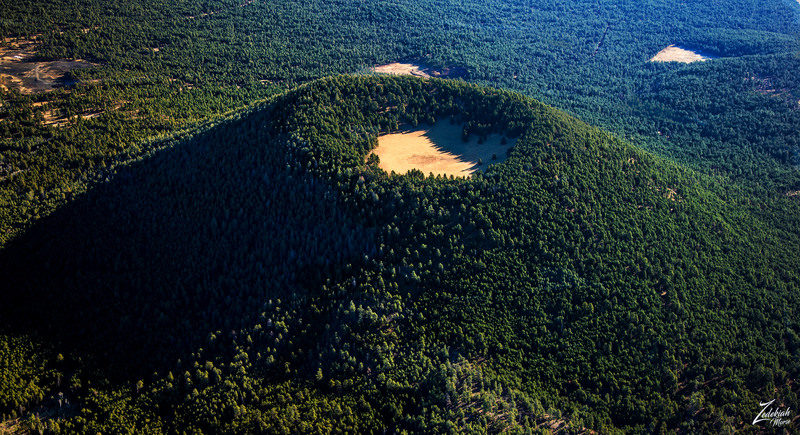 Wing Mountain is an extinct, isolated ancient cinder-cone volcano with a thick forest growing on it. Cinder-Cone Volcanoes are usually made of piles of lava, not ash. During the eruption, blobs (“cinders”) of lava, blown into the air, break into small fragments that fall around the opening to the volcano. The pile forms an oval-shaped small volcano, as shown in this picture. Cinder cone volcanic remnants can be found along a large swath of the southwest USA and they are mostly rough and rugged obsidian and are inhabited by a limited and very specialized flora and fauna. Rising 1,000 feet about the surrounding area, this volcano has a large dish-shaped central depression that marks the site of the ancient volcanic crater. This crater was cut into pasture grazing land by the rancher who named it Wing Mountain back in the 1800’s. For years they would drive cattle up the mountain into this meadow.